Chitwan National Park is the best known and most popular of Nepal's parks, located in the lowlands of the Terai, a short flight or 4-5 hour drive from Kathmandu or Pokhara. However you get here, you will be impressed by the amount of wildlife and the range of activities available here. Chitwan was Nepal’s first National park, established in 1973 to protect the rare Asian one-horned Rhino which was then on the verge of extinction, and has been very successful in protecting this species. Although there are many large mammal species here, including about 100 tigers as well as sloth bears, wild boars and rare antelopes and wild elephants, it is the rhinos that are the parks real draw. 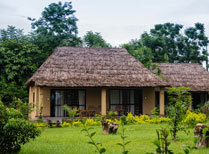 There are over 500 rhinos within the park, and you have a very good chance of spotting rhinos during a stay here. Elephant-back safaris are the best way of getting through the park, lifting you above the tall grass of the Terai and through the dense undergrowth of the jungle to areas that are impossible to reach by car. 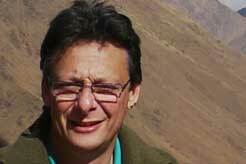 It is also possible to explore the region by jeep, on foot or by canoe. Each method of travel has its advantages and Tribes recommends that you include as many activities as you can to really make the most of this UNESCO World Heritage Site. 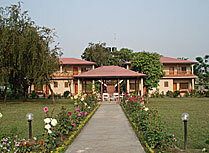 A small resort in a quiet setting, ideal for exploring the wildlife and scenery of Chitwan National park.